Firstie Favorites: Writing Center: Here We Come! Okay so I NEED to get my work on writing time REVAMPED for the upcoming school year. For the past two years, my Daily 5 Work on Writing time has consisted of journal writing, journal writing, and more journal writing. (We do have a writers' workshop in the afternoon during which time we do more formal writing projects). All I have to say is that in my experience, journal writing becomes boring and a chore to kids after about the first month of school. This year, I AM DETERMINED to get my kiddos excited about Work on Writing time! And what I need is WRITING CENTERS! I am going to have 5 different writing "centers" that students will rotate to throughout the week. ALL of these centers are a work in progress right now. 1. THE WRITING CENTER EXTRAORDINAIRE: list making, letter writing, card making, postcards, etc. My goal here is to have tons of fun writing materials and options for kids to "play" with writing and have free time to create! 3. Writing Puzzles: A variety of different sentence building activities that we will complete throughout the school year. 4. Story Writing Center: A center with story starters, mini books, and materials that kids need to write their own stories. 5. Handwriting practice- My first grade team makes handwriting books for kids to practice letter formation. I will also have various handwriting activities that are a little more interactive. Click the picture to access my TPT store. 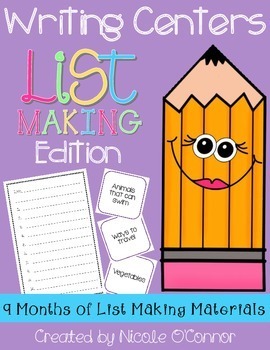 In this writing center pack, I created list-making task cards for each month of the school year and a set of list making paper for each month. Total of 160 cards and 9 different list making paper options. I already printed and laminated 5 sets of my September list making cards and I have them ready to go in a basket for my writing center! Can't wait for the kids to use! On to making my next items for my WRITING CENTER EXTRAORDINAIRE! Check back for more writing center ideas and freebies!